Since 1988 I am growing all kinds of alpines in tufa. 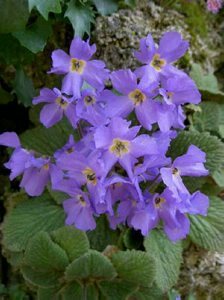 If you look up a book about the cultivation of alpines they always say; “The best stone to grow your high alpines in, is tufa”. Is this true? Why is this material so popular. Tufa is in a way not an old stone. It has build up even in the last decades. In the mountains you can sometimes find streams where tufa is “growing”. Tufa stones are very porous and therefore light. It can absorb a lot of water and releases to much water again. During drier periods it will provide the plant with the moister which stays for quite a long time in the stone, even when the stone looks bone dry from the outside. This is because of the porous structure, like a sponge, that the roots can penetrate into the tufa. 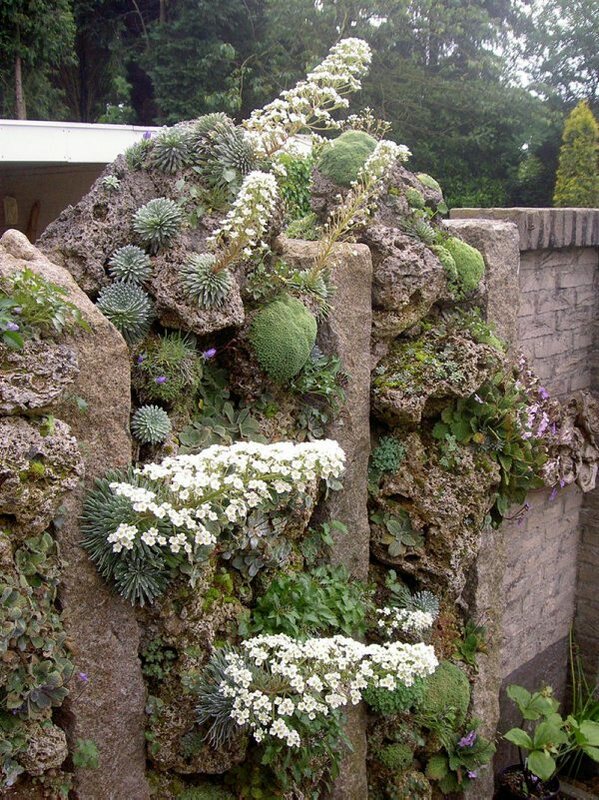 The first question is, how and where do I get the tufa for my rockgarden or alpine house. On the continent of Europe tufa is available in Germany, Switzerland, France, Italy and the Czech Republic. In some countries there are very big quarries. They not only sell big rocks, but also nice tufasand that is very useful in the growing mixtures. It is very important to choose the medium hard stones. They will not break after some frost. For this reason it is important to collect your stones yourself at a quarry, if possible. In this way you are sure of the quality. 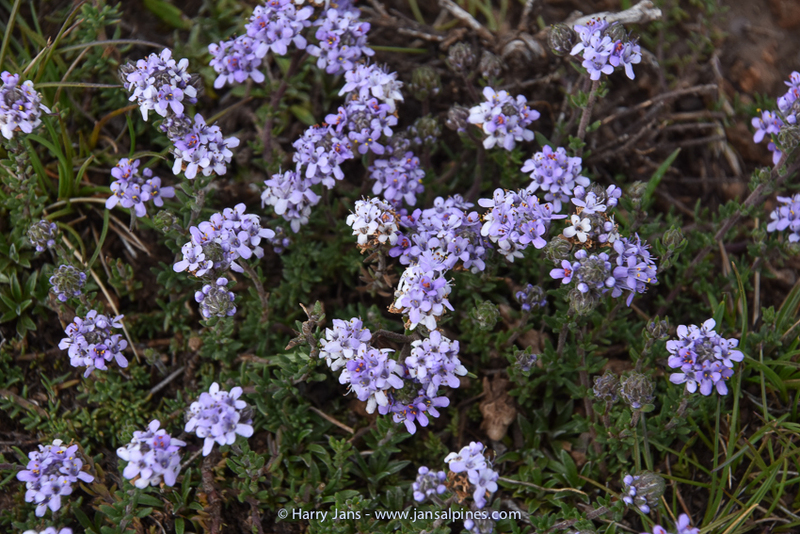 Tufa is a very expensive stone, but it does not die like so many rare and expensive alpines. So it is wise, if you want to build a new rockery to invest in good stone. 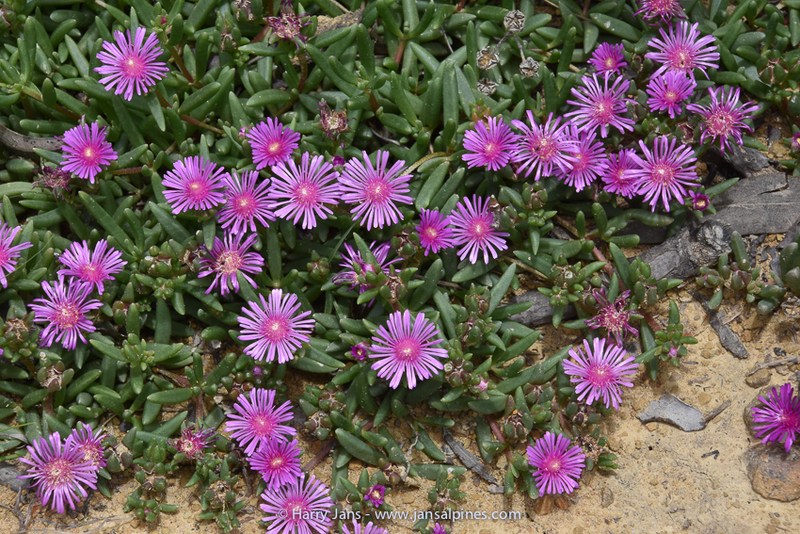 They will last forever, something that you cannot say about some alpines. You are lucky when they survive just a few years. 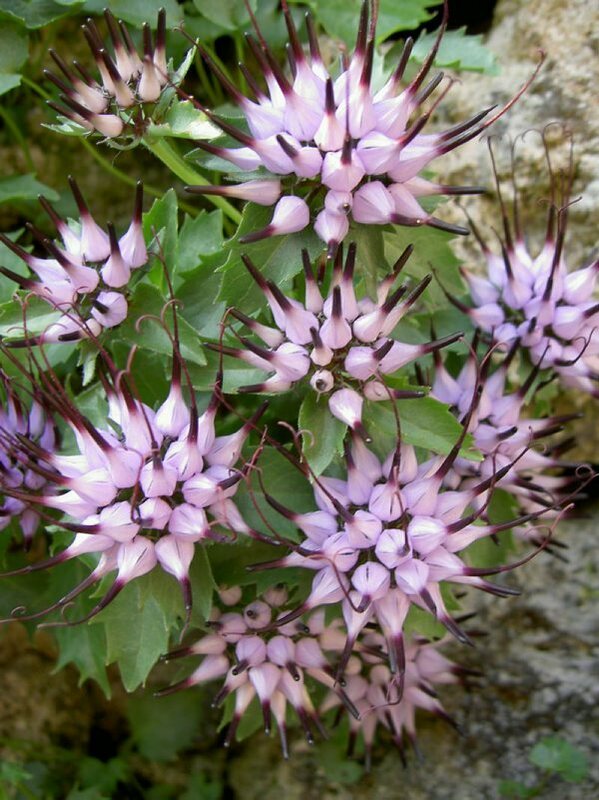 Except when you are planting these in tufa. 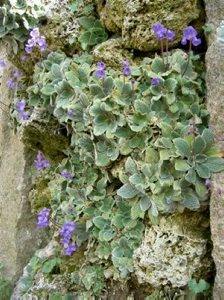 Tufa can be the key to success of many difficult to grow alpines. If you choose to use tufa, try to get rocks as big as possible. One big rock can hold many tiny alpines and is already a small rockgarden on it own. 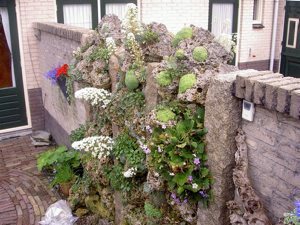 In my garden I have tried to use tufa in many different ways. 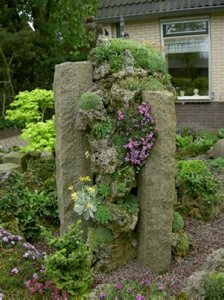 As rock for the rockgarden, in a tufawall, in a tufacolomn, a big rock on a stainless-steel pole and in a tufawall in the alpine house. In all these ways, different plants where chosen to settle down on each different structure. Planting tufa is not difficult but it takes a long time to plant all your tufarocks. I drill holes 2,5 cm wide by a maximum of 15 cm deep. The holes slanted slightly downwards and are sometimes interconnected. 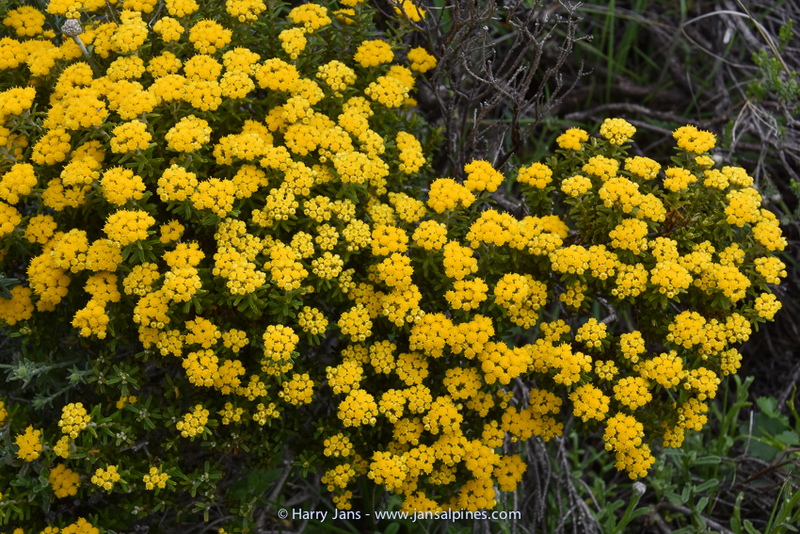 Selecting where the holes should be drilled requires a great deal of thought as the holes have to suit the needs of high alpine plants with sensitive moisture requirements. The holes are partially filled with a mixture of 60% tufa grit (0-3 mm), 10% peat, 15% fibrous loam and 15% chopped spangnum moss. Each selected plant is then put in position, carefully and gently spreading the roots, the holes are filled up and the soil firmed cautiously with a suitable stick or rod. Remember always the roots are very easily damaged. Sometimes the plant is anchored with small pieces of tufa round the neck to prevent it from being pushed out by the first frost. For planting I use small plants. Seedlings which are big enough to handle are ideal to be planted out. Well-rooted cuttings give also good results. Another method is to saw fresh seeds directly on the tufa rocks. Because of the super results I do not even bother in putting some of the seeds in the seedpods first. You will see that it will take some years but many seeds will germinate and these give the best plants. Many plants are very happy planted out in tufa. All the more a less common saxifrages are doing extremely well in this medium. Even the Himalayan saxifrages like S. hypostoma, S. pulvinaria and S. loalensis are happy and flower well and make good compact cushions. Saxifraga longiflolia seeds itself out on many places in the garden and grows at extremely vertical places, because I have blown in the seeds a few years ago. S.valdensis, on the south-side of my tufawall looks nice and healthy and flowers every year. My inspiration for building has come from a wall made out of concrete and tufa at the botanical garden in Brno in the Czech Republic. 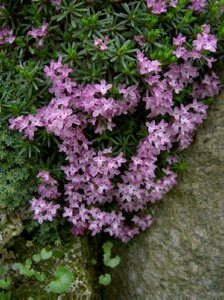 In my opinion such a wall is the best way to grow rare and difficult alpines. I built my tufawall in 1990; this has become the best part of the entire garden. The plants are really thriving here! The wall consists of four granite curb stones placed vertically 50cm (20″) apart. This space has been filled with chunks of tufa. In Brno the tufa was laid up dry, but I cemented them together. This created one large massive wall. If holes have been left in between (as dry laid wall) the wind would dry out the stones rapidly. 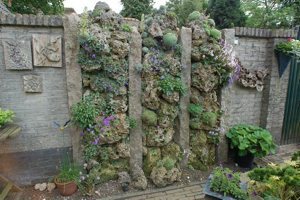 My wall has a north facing exposure as well as a southern one, resulting in a great variety of plants feeling home.The odd shapes of the tufa created perfect planting conditions. Approximately 200 holes were drilled into the stones of 25mm (1″) diameter. These have been filled over the years with many different rock garden plants. 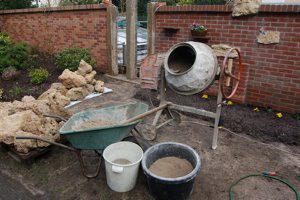 The planting medium I have used consists of potting soil, sharp sand, tufa dust and finely ground peat moss. I also add a small amount of Mini Osmocote.The north side of the wall houses one of the great eye catchers of the garden: a colony of Jancaea heldreichii. This plant, which is supposedly very difficult to grow, feels quite at home in this wall- so much in fact, that over 40 seedlings have sprouted.Other plants in the tufawall are: many different Kabschia saxifrages but also Dionysia aretioides, D.tapetodes, Androsace helvetica, A.pyrenaica, A.vandellii, A.cylindrica, Primula allionii, P.marginata, P.auricula albo-cincta, Asyneuma pulvinatum, Kelseya uniflora, Daphne petraea, D.arbuscula, Campanula morettiana, C.raineri, Jankaea heldreichii, x Jankaemonda vandedemii, Ramonda serbica, Gentiana terglouensis, Draba acaulis, D.polytricha, Viola delphinantha, Thylacospermum caespitosum, Physoplexis comosa and many others. Even Pleione limprichtii grows well in the moss on the tufawall. The plants in this wall are doing so well that I have decided to remove an existing hedge of conifers to replace this for another tufa wall. 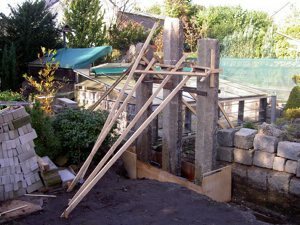 (build winter/spring 2006) It will take some time for the plants to establish but it will be worth it.